Simply click on the image to access the report. No opt in required. What is it that is going to attract a lot of potential customers for a variety of businesses if not a more vibrant local economy? In fact, where there are more people, most businesses have gained potential customers. This means that businesses new and old need to step up their marketing campaign to get the word out to new and old residents alike that they can give them what they need. 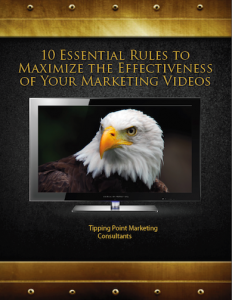 Whether your business is a hair salon or a grocery store or anything else, Tipping Point Marketing can help you out in all areas of marketing, including video production. Our video productions services are the perfect complement to the many other services we offer. On top of SEO services that offer an SEO campaign like no other, along with our graphic and web design services, we can offer supplemental marketing pieces in the form of videos. These may be short commercials to air on local television stations, or creative marketing videos to post on video sharing sites. This is very popular as it is a way to get it in front of a lot of people for no financial investment. The way this works is that after we help you with your video production, we can post it on a video sharing site after you review it. Then the goal is to get it shared, posted, and reposted as many times as possible. Combined with a killer SEO campaign, the video could pop up in search engines, and with a great internet marketing campaign, you can link ads and related blog posts back to the video as well. It is something visual for potential customers who have too much going on to sit and read, and it can be much more eye catching and exciting than print. Video production services companies are not that easy to come by. Let our professionals help you make the perfect video to supplement whatever marketing campaign you have in place, or let us create a whole campaign for you including videos for various venues. Whether it will be part of an internet marketing campaign or play on the local televisions channels, nothing turns people off like a poorly done video. A video campaign can make or break you, and we aim to ensure that the video we produce for your business makes only good things happen.